SEO is the process of crafting a website so that search engines are more readily able to find it, index it and determine relevance to the search query. There are many factors that contribute to the ability (or inability) for Google to find your web pages and hundreds of ‘signals’ that indicate relevance. The best strategy in organic search is having intriguing and unique content written for people. What makes Google find and insert a specific website at the top of a search? For instance, why does a search for ‘ribs recipe’ give the website Allrecipes.com love when your ribs recipe on your website are nowhere to be found? 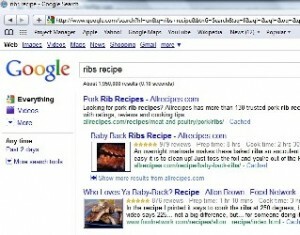 It could be because of many reasons but most importantly, is the search term ‘ribs recipe’ important to you? SEO is a complicated and finicky business as all experts outside of Google, Yahoo or Bing employees are not on the inside of how exactly these engines work. We have our best practices. But unless you’re deep in the inside, you will never know 100% of how they work and the weights of all the different parts of the their super-secret algorithms. The best SEO’s can do is know all the factors involved (200 or so) and make their best guess as the to weight of the factors in the algorithm. The best way to start a solid SEO practice on your website is identify what keywords are important to your business and where your competitors rank in the Search Engine Results Page (SERP). If your business is home building and you’re located in Evanston Illinois, the keyword ‘Evanston home builder’ would be important right? Obviously. But so would many, many others such as ‘custom homes’, ‘green construction techniques’ and so on, supposing your construction company actually performed these types of practices. Once you have your keyword list built, you must use these words in your content and many other places in order for the engines to establish relevancy to your site and keywords. A page titled ‘new home design’ should in fact contain content discussing new home designs. Simple enough, right? There’s a lot more. Linking, indexation and distribution via media channels of your website are also very important factors in SEO that require well thought out and inspired work to get your site noticed by search engines. Drop us a note and we’d be happy to look at your site and see if there are easy ‘wins’ for improving your site’s search engine visibility. We perform SEO Audits and would love to assist you in your quest to search marketing solutions.